EUR is being supported by the Italy and Euro negotiations. Meanwhile USD is gaining power since the time trading session has started. 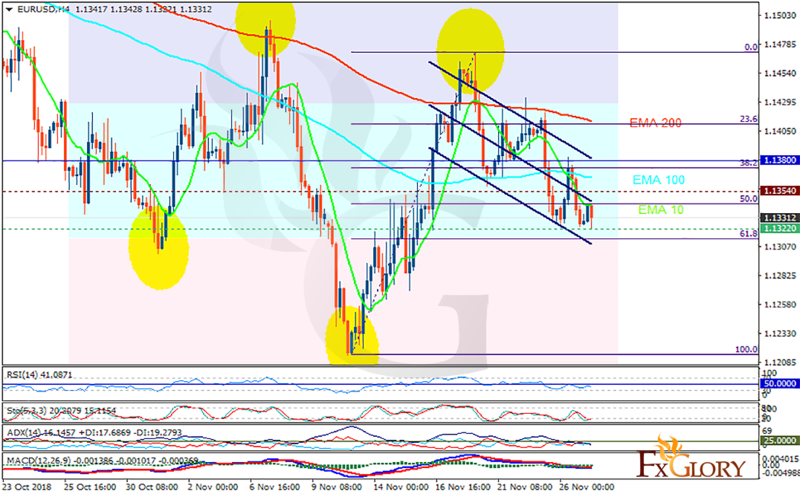 The support rests at 1.13220 with resistance at 1.13540 which both lines are below the weekly pivot point at 1.13800. The EMA of 10 is moving with bearish bias in the descendant channel and it is below the EMA of 100 and the EMA of 200. The RSI is falling towards the oversold area, the Stochastic is moving in low ranges and the MACD line is below the signal line in the negative territory. The ADX is showing sell signal. The price has almost reached the 61.8 level of Fibonacci but it may even fall lower towards 1.29; then buyers can return to the market.